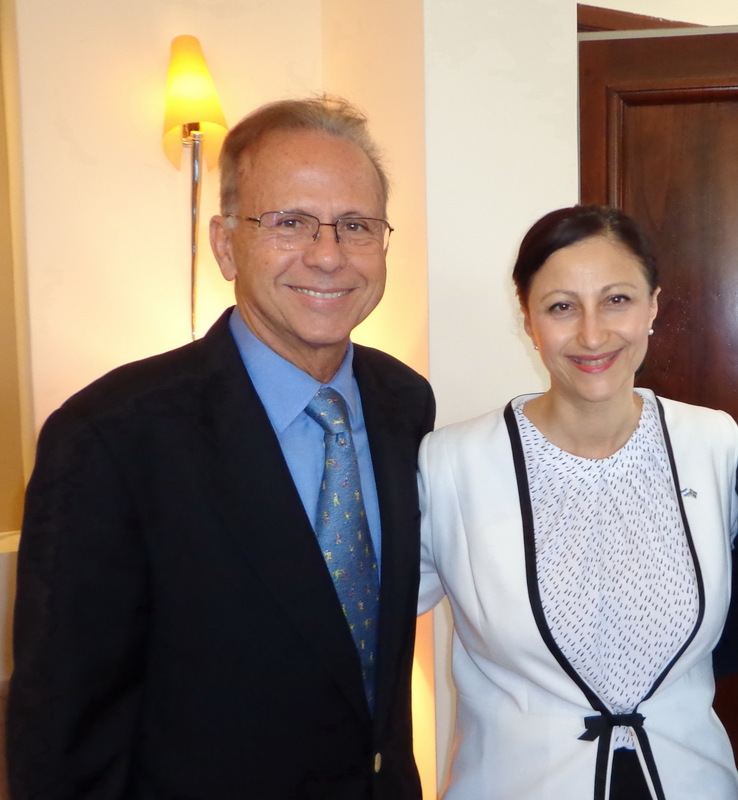 Marcos Aguinis, Tomas Kertesz and Swedish Ambassador Gufran Al-Nadaf. Quite a gathering took place on 25 February 2015 at the residence of the Swedish Ambassador in Buenos Aires to commemorate the 70th anniversary of the disappearance of Raoul Wallenberg. Invited by Swedish Ambassador Gufran Al-Nadaf and Eduardo Eurnekian, Chairman of the Wallenberg Foundation, more than a dozen ambassadors, among other diplomats, as well as specials guests, attended the ceremony to remember the courageous feats and unmatched personality of the Swedish diplomat that helped save the lives of thousands of persecuted individuals in Hungary during WWII. The following ambassadors attended the ceremony: Noel Campbell, Australia; David Cameron Murphy, Canada; Jean Michel Casa, France; Jukka Siukossari, Finland; Zeljko Belaj, Croacia; Grete Sillasen, Denmark; Eleni Leivaditou, Greece; Petr Kopriva, Czech Republic; Alexan Haroutunian, Armenia; Alfonso Diez Torres, European Union; Estanislao de Grandes Pascual, Spain; Patrick Renault, Belgium and Janne Julsrud, Norway. Also, Ewa Majkut, Embassy of Poland; Nathan Brooks, Embassy of Israel; Klaus Schmidt, Embassy of Germany; Federico Villegas Beltrán and María Carolina Pérez Colman, Argentinian Foreign Ministry; Estera Mkturian, Consul of Armenia; Bita Rasoulilan, Embassy of Austria; Bishop Oscar Sarlinga, Rabbi Simon Moguilevsky, Director of the Buenos Aires Jewish Museum; David Drukier, Vice President of DAIA, and Alexis Bulgari, son of Constantino Bulgari, a Righteous Among the Nations, among other guests. Alexis Bulgari and Swedish Ambassador Gufran Al-Nadaf. Ambassador Al-Nadaf delivered the opening speech (Spanish) with a brief, precise and moving recapitulation of Wallenberg’s mission and deeds. “We have learned much of what happened during World War II but, nevertheless, that does not seem so considering what is happening today in the world. We need many more Wallenbergs. Today we live in a world where anti-Semitism, Islamophobia and anti-Gypsyism are growing faster. And in Europe no less than elsewhere.”, she said. Ambassador Al-Nadaf was followed by Marcos Aguinis, renowned Argentine writer and IRFW Member of the Board, who underlined the necessity of live without fear in a world where ethnical and political violence seems to be the common denominator. The closing words were delivered by Tomas Kertesz (speech in Spanish) (87), who thrilled the audience by recalling his experiences as a youth persecuted by the Nazis while serving as one of Wallenberg’s assistants. 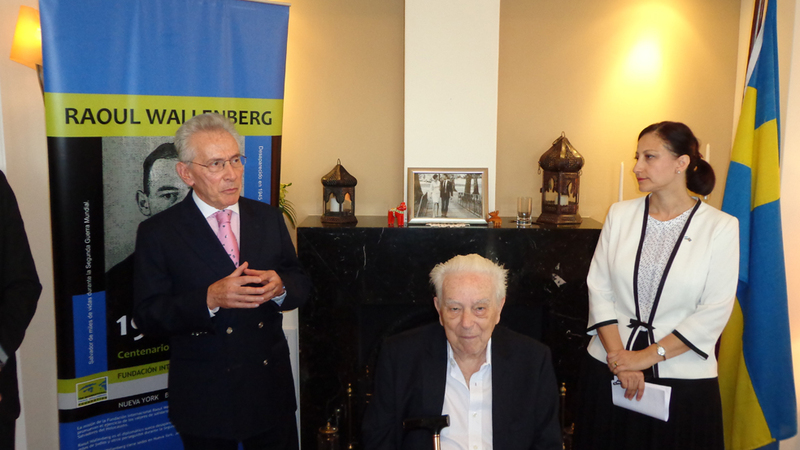 The Wallenberg Foundation was founded by Baruch Tenembaum, 2009 Nobel Peace Prize candidate. Its mission is to research, preserve and promote the brave legacies of the Holocaust Rescuers, courageous women and men who saved the lives of persecuted people. More than 300 Heads of State and Nobel Prize laureates comprised its membership. Jorge Mario Bergoglio, current Pope Francis, is one of its founder members.